Dogs are usually good at catching balls, hunting and sniffing things, but they can also become amazing swimmers. Some races seem to have been born to stay underwater and do not need classes, others do not have as much affinity with swimming. Anyway, the owner should teach the dog to swim even if he was already born with ability for the sport. 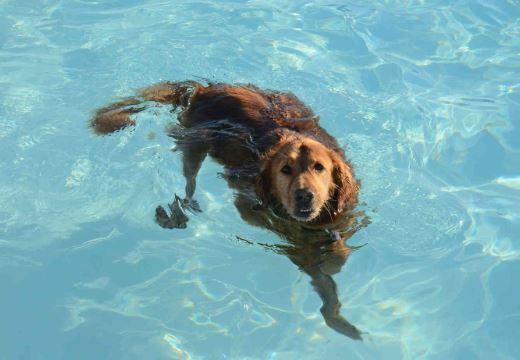 There is a belief that canines are born knowing how to swim and can turn around in situations involving water. This, in fact, is a myth. Thoughts such as this lead tutors to neglect and increase the chances of an accident. So the best way to avoid a tragedy is to teach the dog how to swim. If you wish, you can hire an animal trainer, but you can guide him by following the step-by-step instructions below. Fortunately, it is not difficult to make most breeds swim with encouragement and help. With calm, patience and security you will transform your companion into an excellent swimmer. However, be prepared to get wet enough so choose warmer days for class. The choice of place is very important for the classes to succeed. Never start learning without first knowing the place well, as it can endanger your life and that of the pet. The ideal is an environment with calm and translucent water, such as a swimming pool or a clean pond with sufficient depth for immersion, ie the dog should not reach the ground if standing. Avoid the use of rivers, since they are usually very dirty and with strong currents. Make sure the chosen location accepts dogs. Any concern you have for not being where it should be will be transferred to the dog. Then check that there is no obstruction or underwater object that can reach the animal. Locations with large amounts of plants, for example, can trap pet paws and be a problem. Any obstruction increases the chances of an accident, so it’s best to avoid it. Take some toys and snacks to catch the animal’s attention and serve as a reward. It’s good to be prepared to encourage you to do what you teach. Not all races like water or swimming. You know your dog better than anyone else and know your limitations. Do not force him to do something he does not want. It is important to respect your desires so that the owner and animal relationship is not affected. If your partner has no problems with water, expect him to dive alone. It is essential that he feel comfortable and trust the environment. If he is suspicious or fearful, it is possible to encourage his curiosity through jokes. Before starting classes, the pet needs to get used to the water. Start by throwing your favorite toy in a shallow part, so that it can catch and still stand. If he does the exercise correctly, reward him with a tidbit and praise. Repeat until you are familiar with the water and happy with the joke. After the animal is accustomed to the water, it is time to teach it to swim. First, take it on your lap, enter the pool or pond and walk until the water is at waist level. Put it in the water, but do not let go. Hold both hands under your belly. Notice if he starts to move his legs on his own. The more likely you are to have that reaction, for it is instinctive. Allow him to “swim” by himself, but keep holding until he develops a good shape and feels stable and secure in his movements. If you’re doing it right, praise it and give it a treat when it comes out of the water. Also, Can you take the dog to the beach or not? Let him swim alone and teach him to get out of the water. Once you are safe in your movements, start releasing it slowly. After a few minutes of swimming, turn him toward the ledge to teach him to go out by himself. Start walking towards the exit, since it is most likely that he will follow you. Do not take your eyes off it during the whole process and do not step too far, because you should be close if you need to help. The pool should have its own ladder for animals, so the dog can leave without the help of a third party. Keep walking towards this ladder and see if the pet can climb up and out. Help him if you have to. Repeat this step by step several times. The more the dog trains, the better it will be. In a short time you will be swimming perfectly and without needing your help. Not all dogs are born with the instinct to swim. The physical structure of certain races does not allow this type of exercise, running the risk of drowning if not held by someone. Pets of this type should not swim without the use of a vest and someone around. Remember to bring your own swimming gear, as you will need to get into the water during class. If you have a pool at home, buy a safety net to prevent the pet from throwing itself into the water at inappropriate times. Do not yell at your dog if you have difficulty learning to swim. It will only make you and the water afraid. Teaching the dog to swim requires dedication, positive reinforcement and perseverance. Continue the lessons until he learns, if not everything will have been in vain.